White End Loading Locking Mailers are great for small package shipping. There are a number of reasons to choose this item to ship your product in. For packaging made easy, these mailers offer a side loading design suitable to ship documents, clothing or small articles. The self-adhering tabs are convenient for sealing without packaging tape. 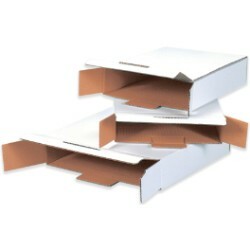 The white boxes are more attractive than the standard brown of corrugated cardboard, providing a more appealing impression. Available in a variety of 3 useful sizes: 11 1/8'' x 8 5/8'' x 2 1/2'', 12 1/8'' x 9'' x 2 1/2'', and 12 1/8'' x 11 5/8'' x 2 5/8''. Shipped flat and sold in bundles of 50. Our experienced and knowledgeable customer service team is ready to assist you with all your packaging needs Mon-Fri 8am-4pm CST at 866-437-8775.